A comprehensive guide and fact sheet about Human Sacrifices. Discover fascinating facts and information about ancient Egypt and Human Sacrifices. Click a link for additional information and interesting facts about subjects relating to Human Sacrifices or other aspects of daily life, the people and places of ancient Egypt. The unsavoury subject of Human Sacrifices is not usually associated with the ancient Egyptians but their earliest period of history, the Predynastic Period, is equivalent to the Neolithic period, the last part of the Stone Age, when religious beliefs and rituals and practises were being established. As the civilization of ancient Egypt developed the country entered the beginning of the Early Dynastic Period during which the culture of the Egyptians significantly advanced and the archaic practise of Human Sacrifices disappeared. There were distinct types of Human sacrifices. Humans were sacrificed to the gods as offerings to ensure the well being of Egypt, such as a good harvest. Up to the end of the first dynasty the pharaohs or kings of Egypt practised a form of Human Sacrifice, referred to as 'Retainer Sacrifices', in which members of their royal household were chosen to be buried with their king to serve them in the Afterlife. The number of subsidiary retainer graves gradually decreased and the practise of this type of human sacrifice ceased abruptly at the end of the 1st dynasty when 'shabtis' took the place of actual people. The following fact sheet provides facts and information about the Human and Retainer Sacrifices that were practised in the earliest periods of ancient Egyptian history. Learn about the methods and victims of sacrifice in ancient Egypt the fast and easy way via the Human Sacrifices Fact sheet. Fact 1 on Human Sacrifices: Many ancient, pagan cultures, such as the Mayans, Incas and the Aztecs had cultures similar to ancient Egyptians and practiced human sacrifice. Fact 2 on Human Sacrifices: Victims: The victims of these type of sacrifice rituals included servants, enemies, prisoners, convicts and virgins. Fact 3 on Human Sacrifices: Reasons for sacrifice: To ensure the well being of Egypt by making sacrifices to the fertility gods to ensure a good harvest. Fact 4 on Human Sacrifices: Reason for sacrifice: To placate the gods during calamities and natural disasters that affected the whole nation such as drought, famine and plague. Fact 5 on Human Sacrifices: Reason for sacrifice: The fertility gods associated with the River Nile were extremely important to the ancient Egyptians. Too little flood water would cause a terrible famine, and too much water would be equally catastrophic by limiting the sowing of fresh crops. Offerings, in the form of ritual sacrifice, were made to these gods to make the crops grow well and to bring a good harvest. Fact 6 on Human Sacrifices: Offerings to the gods: The above picture depicts the sacrifice of a virgin to a Nile god. Virgins were chosen because they were pure and highly valued. Fact 7 on Human Sacrifices: Ritual killing and executions. These are referred to as execration rituals which involved the abasement and destruction of the enemies of Egypt. Execration rituals continued up to the period in history referred to as the New Kingdom. Fact 7 on Human Sacrifices: Ritual sacrifice killing and executions: The following picture forms part of an ivory label from the reign of King Djer and is believed to represent an execration ritual killing, a rite of human sacrifice. One figure (with a pointed beard) appears to have his arms tethered behind his back. The other figure seems to be plunging a knife into the enemy's chest. The 'executioner-priest' holds ready a vessel in which, presumably, he will catch his victim's blood. Fact 8 on Human Sacrifices: Execration rituals and sacrifice: The Narmer Palette contains some of the earliest hieroglyphic inscriptions ever found and features important events, including an execration rituals, during the reign of King Narmer, the founder of the 1st Dynasty. 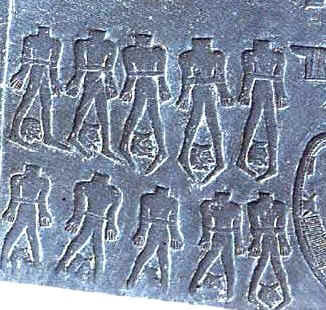 Fact 9 on Human Sacrifices: The following picture taken from the Narmer palette depicts ten headless corpses of bonded enemies with their heads placed between their legs. The enemies were probably Asians. Nomadic tribes of Bedouins who occupied desert lands in Sinai, Canaan, Syria and Arabia. The ancient Egyptians depicted their Asian enemies with pointed beards and dark, often plaited, hair. The traditional enemies of Egypt were collectively referred to as the 'Nine Bows' reflecting the weapons used by their enemies. Discover fast, interesting facts about Human Sacrifices with some amazing, cool and quick information about ancient Egypt and Egyptians. Ideal for homework, schools and teachers. Find fascinating fun facts about Human Sacrifices fand the history, culture and civilisation of the ancient Egyptians and ancient Egypt. Interesting facts about Human Sacrifices for research, schools and students. The following facts provide interesting information about the ancient Egyptian practise of retainer sacrifice. Fact 10 on Human Sacrifices: Retainer Sacrifices. The lives of chosen servants and court officials were sacrificed to ensure the dead king had servants (retainers) to serve them during the afterlife. Fact 11 on Human Sacrifices: Evidence from examining the bodies found in subsidiary graves indicate marks of the throat having been cut or strangulation before the victims were decapitated. Other methods appear to have included death by poison. There is no eveidence to suggest that victims were ever buried alive. Fact 12 on Human Sacrifices: Men, women and children were victims of retainer sacrifice. 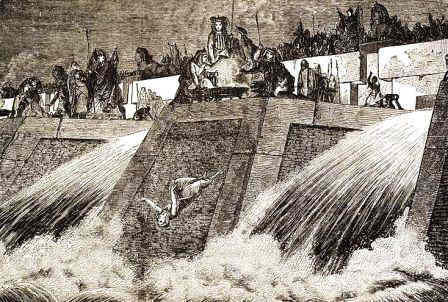 Fact 13 on Human Sacrifices: The practise of this type of human sacrifice ceased abruptly at the end of the 1st dynasty in the reign of Qa'a when 'shabtis' took the place of actual people. Fact 14 on Human Sacrifices: 'Shabtis' were small funerary figurines that were placed in tombs and intended to act as substitutes for servants to do manual labor for the deceased in the afterlife. Fact 15 on Human Sacrifices: From the end of the 1st dynasty no more subsidiary graves were found in the funerary complexes of the kings of Egypt - the practise of human retainer sacrifice ceased without any explanation. 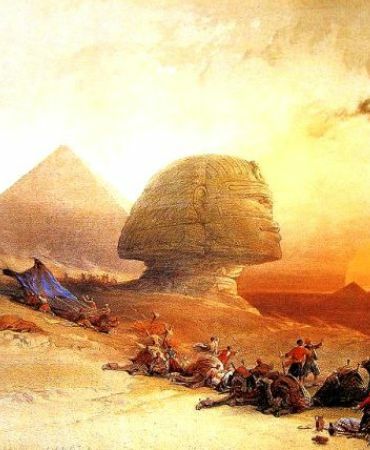 Learning about the ancient Egyptians and Human Sacrifices inspires everyone to visit historical sites and undertake Egypt Travel and Tours to experience the wonders of this magical land at first hand. Many people choose to experience a tour of Egypt on a Nile Cruise stopping at the famous destinations and sites of Egypt such as the Pyramids of Giza and the Great Sphinx. The information and facts about Human Sacrifices will provide you with a great insight into Egypt and the legacy of the ancient Egyptians.